P. Smitherman Electrical has a vast experience of all types of electrical installations in newly commissioned properties working closely with building companies and work carried out to BS7671 standards which are under building control notifications as part of Part P of building regulations’ and the BS 7671 you will find is the British standard for all electrical installations and incorporates the IE wiring regulations. We are able to offer all types of new buildings whether it is a house flat or bungalow or a Barn conversion we are able to offer this service to our customers. 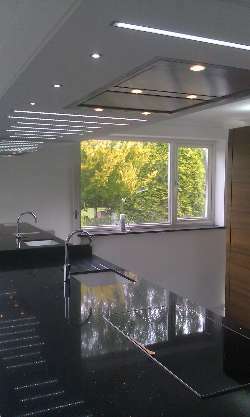 This new build work includes an early design consultation with your builder and Client and then discusses all the customer requirements so we can meet all their aspirations and design ideas and incorporate this in the overall installation thus working to testing of all the installation and electrical certification ensures a complete package to our customer. The Scope of works for the electrical installation of new build does not just include the electrical wiring but now includes fire alarms intruder alarms installation in most rooms for broadband TV and phone points all these have to be commissioned and documented then ensure that at all times the customer is satisfied that their aspirations are met in full we can meet this by the involvement by the customer at all stages of installation. The scope of the heating is down to customer demand and this can be achieved by having under floor heating having remote temperature sensors in each room which can be controlled by remote switch or control allowing the customer to control each room thus saving on heating just contact us on our form from website and we can plan with you for your new build of house, bungalow flat or barn conversion. Care needs to be taken when considering what stage of work how it will progress communication, liaising with suppliers ensuring that items are delivered are of the right specification that the customer has requested that at all times Health and Safety is compliant with current legislation and this can be met by communicating with other trades thus avoiding any delays in the installation also by making sure we do not have any inefficiencies or having to carry out any type of reworking resulting in cost or problems with other trades. P. Smitherman Electrical is an approved NICEIC electrical Part P 17 th edition which for the customer ensures that all work has been carried out to standards and workmanship which are required. After all the work has been carried to our customers and upon completion of the works we are then required to issue the customer a warranty a certificate and are as followed. 1 A one year warranty which covers the work that has been carried out including any of the materials and labour. 2 A Certificate of building regulation compliance that is registered with the customer local authority so that this complies with current building regulations. 3 An Electrical Installation certificate that meets BS7671 wiring regulations which then gives the full details of circuits, fuses, protective devices, the wiring and tests results and then confirms that all of the work complies with the current regulations. 4 The installation conformity and commissioning certificate which depends on the type of systems including fire alarms which are incorporated in to the new build. P. Smitherman Electrical is committed to raise the standards of new build electrical installation and achieve its customers aspirations to listen to comments improve its reputation and to assure that excellence is met at all times.